Broken Hill and surrounds has been a silver screen setting for some iconic films featuring bizarre, eccentric and futuristic ‘transport’. Many movie buffs would recall the Ford Falcon XB GT Coupe “V8 Interceptor” in Mad Max 2, the BMW electric concept car in Mission Impossible II, and Priscilla, the large tour bus in The Adventures of Priscilla, Queen of the Desert, all of which temporarily traversed this Outback region. 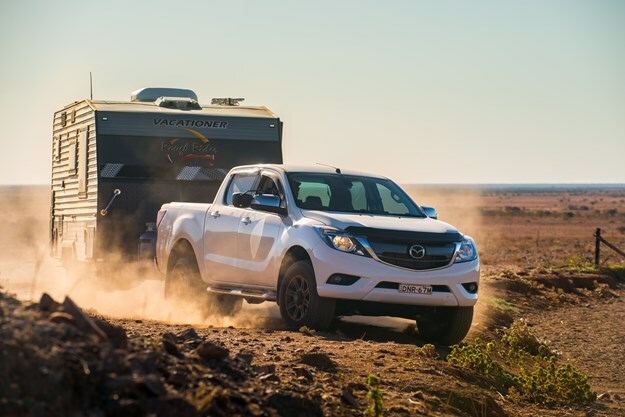 But none of these have been tougher than the super-strong caravan sextet—albeit not from the celluloid genre—that descended upon the isolated and rugged terrain of the Barrier Ranges for AL-KO Toughest Tow Test. And one of the ‘super six’was the aptly named Vacationer Rough Rider 19R. 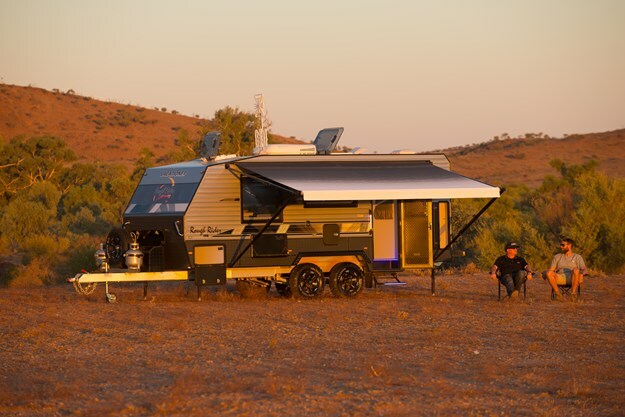 Ironically, many of the ‘cast members’ at historic Eldee Station, in Silverton, will fondly remember the Vacationer Rough Rider 19R which played a leading role during the ‘filming’ of AL-KO TTT. 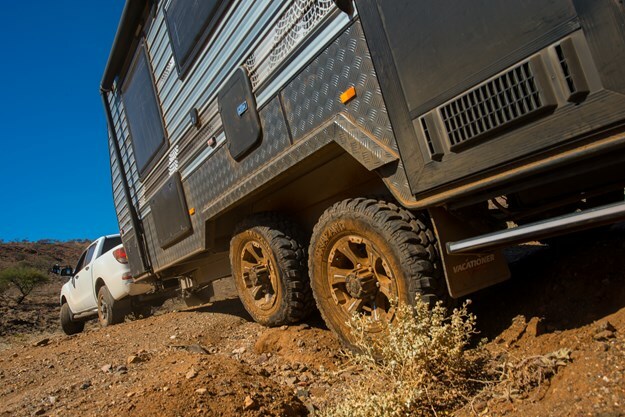 This purpose-built 5.8m (19ft) semi-offroader showed it’s primed for adventure, rough-and-ready style. 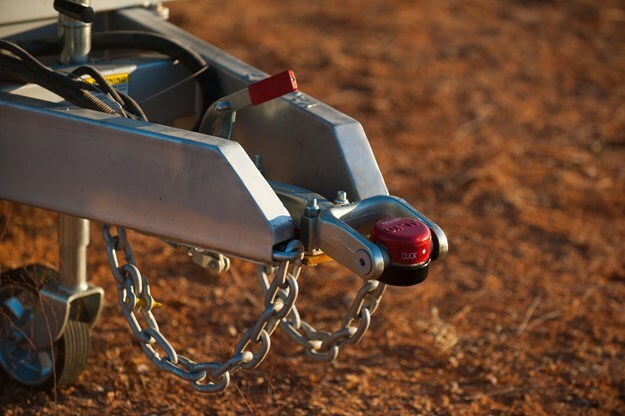 And you can pack for a decent trip considering the whopping 850kg payload at your disposal, which takes the ATM to 3300kg (there’s an option of 3500kg). No doubt its propensity for off-the-grid exploration is greatly assisted by its ultra-reliable AL-KO running gear. Certainly, the Enduro Cross Country suspension didn’t let it down, while the recessed offroad lock pin coupling offered great articulation. And it exhibited infinitesmal sway, courtesy of the fitted ESC, over the tricky terrain. I also liked the Rough Rider’s additional arsenal for hitting faraway tracks for extended periods. 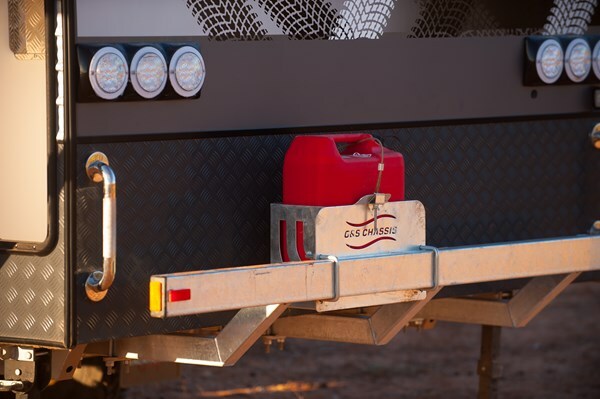 It carried dual 120Ah AGM batteries, twin 95L freshwater tanks plus a 95L grey water tank, and 300W of roof-mounted solar power. And I noticed that the water tanks had galvanised guards. 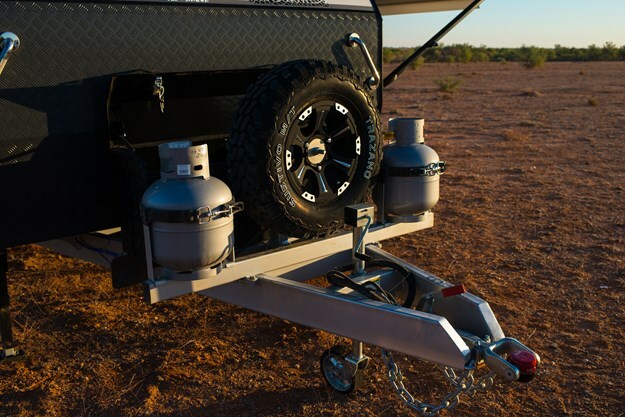 And you can throw in a sturdy aluminium armour, a 6in G&S Supagal (there's an option of hot-dipped) chassis, with good clearance provided by a 4in raiser, 10in offroad brakes, and heavy duty 15in mud-terrain tyres for good measure. Meanwhile, the 6in A-frame extends past the suspension and extends 450mm to the front of the suspension. However, due to the lack of a stone guard, the front of the van—particularly the twin 9kg gas cylinders and spare wheel—is vulnerable to the type of conditons served up at TTT. However, I do like the smooth composite finish over a significant area of both the front and rear walls. Other boxes it ticks on the outside are Euro double-glazed windows, a rear-view camera with car monitor, a checkerplate toolbox, gas bayonet, fold-down picnic table, roll-out awning with cradle, exterior shower, mesh and tap protector on the A-frame, jerry can holder mounted on a three-arm bumper bar, outside speakers and external 12V TV entertainment, if that’s your whim while out in the sticks. 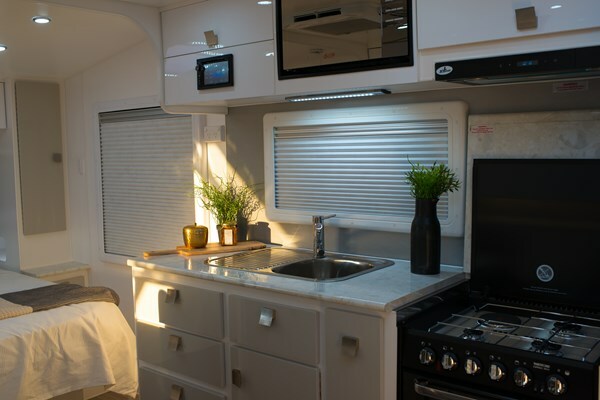 I’m impressed that it also boasts a large rear hatch, a Winegard antenna, twin annexe lights, LED roof hatches over the kitchen and bed, strip lighting in the moulded stepwell, and stainless steel grab handles. 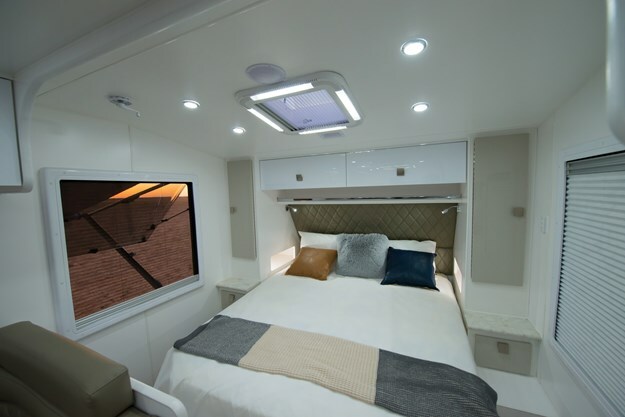 Meanwhile, climatic comfort is provided by a Houghton Belaire 3400 roof-mounted reverse cycle air-conditioner, along with an insulated roof and walls. 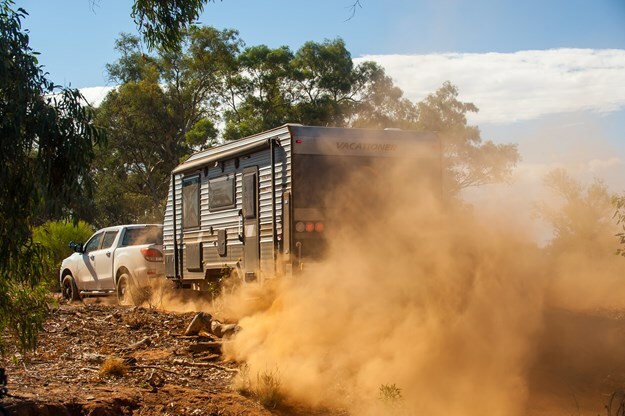 Vacationer says the Rough Rider has been designed to providethe highest of comfort in the toughest of Australian conditions. And I’ll second the motion! I’d also add that it also stands out for design, attention to detail and affordability. The Rough Rider is ‘rough’ on the outside and equally ‘ready’ on the inside. I simply relished its contemporary, up-to-the-minute interior. 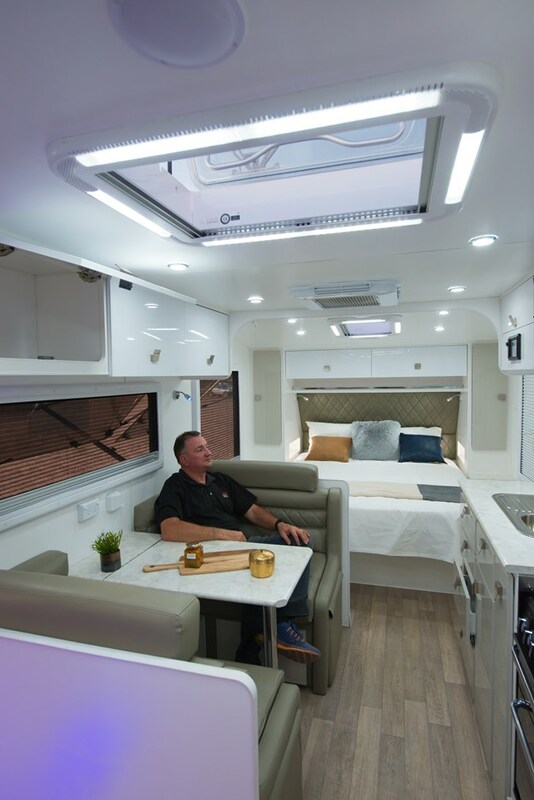 Attention to detail extends to the heavy-duty spring-loaded hinges on the overhead cupboards, soft-close drawers and square handles throughout, plus robe cutouts with a light and USB 12V point/double powerpoint. 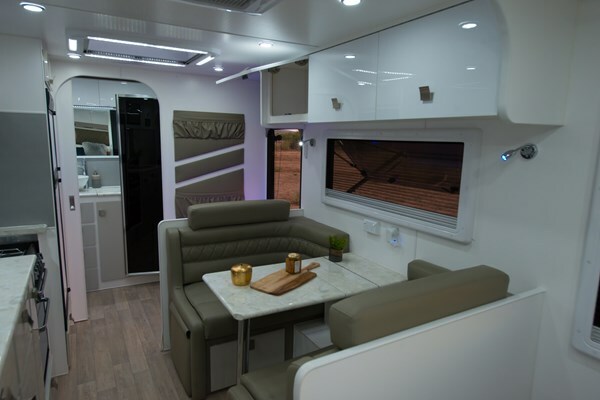 And there’s plenty of comfort courtesy of the luxurious upholstery adorning the cafe dinette, with footrests, headrests, reading lamps and a 12V USB point for added relaxation, and an innerspring mattress and large bedhead in the boudoir. It’s appropriate to add that the abundant storage in the bedroom and living zones is a constant theme throughout the van. The modish galley is equipped with all the requisites for intrepid travellers, including a Thetford full oven, 192L Thetford AES fridge and 23L Swift microwave, which I thought was set too high. 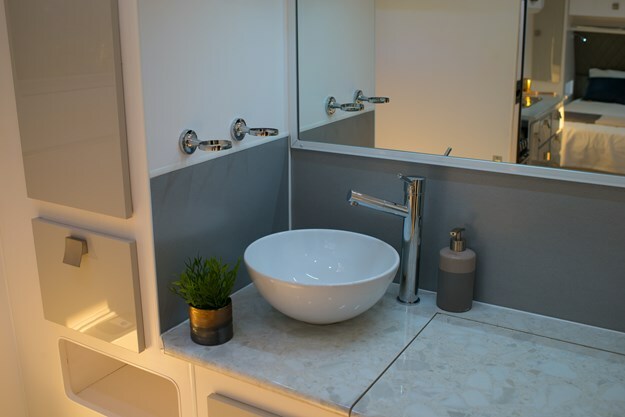 I also liked the large sink bowl and new tapware with built-in filter, while all your hot water requirements are provided by a 28L Swift gas/electric system. But the mod cons don't end there as the chic ensuite features a ceramic basin and toilet, and a full one-piece moulded shower. And while you’re collecting dust in the blue yonder, a 3.2kg NCE washing machine will be welcomed with open arms. Meanwhile, internal entertainment is via a 24in TV with swivel arm, and a double DIN DVD player. And I must say that the one-piece vinyl flooring is easy on those travel-weary tootsies. 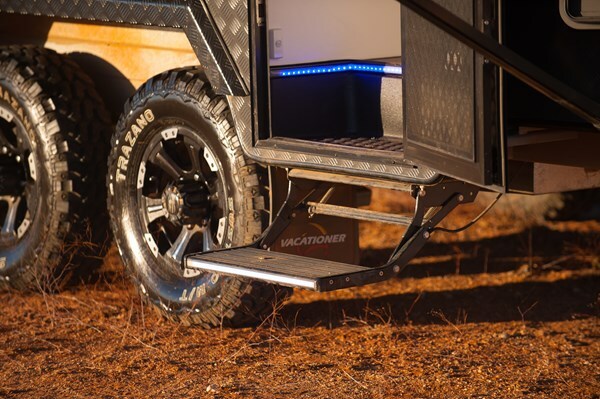 Excuse the corny phraseology, but like that wacky tour bus in The Adventures of Priscilla, Queen of the Desert, travelling in the Vacationer Rough Rider 19R is a case of “I know I will survive!” in Australia's harsh remote topography. It’s a great package and, given a hint of opulence, there’s a high sense of affordability at just under $73K.